There are two diagrams presented here. When addressing siblings in Christ, the Bible introduces the issue of age as a factor in how siblings in Christ should relate to one another. 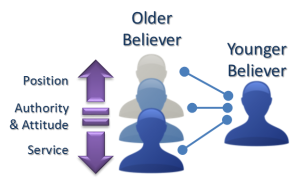 The diagrams demonstrate that it is not an extremely simple relationship where the older sibling in Christ is always “over” or “above” the younger sibling in Christ. However, the idea is conveyed that respect and honor is given to those who are older. Even with some elevation for one who is older, it does not mean that the younger sibling in Christ is subservient to the older sibling in Christ. The Bible emphasizes the idea of “one another” ministry in more of a mode of equality and mutual submission which is not hierarchical, but like siblings in a family with a father (i.e. God the Father). Each sibling in a family has full standing and rights with God the Father, but some special standing is given to the ones who are older in relation to the ones who are younger. Younger siblings do not have to go through older siblings in order to relate to their father. They have direct access to God the Father, but should relate to their older siblings with an appropriate level of respect. If we exclude any consideration of “leadership”, the Bible never shows a younger sibling in Christ to be positionally above an older sibling in Christ. This should understood in the simple sense of age and honor, not in level of education or gifting by the Holy Spirit. There are additional verses where Paul makes it clear to Timothy not to allow others to think of himself as less because of his age because of Timothy’s gifting (1 Timothy 4:12,14). Since Timothy is considered by most to be a leader, this balancing idea does introduce a facet of “leadership” into the discussion which will be addressed further later on in another section. In an attempt to prevent confusion, keep in mind that this section is focused on the sibling relationship without considering any aspects related to leadership. Depending upon your background and education, you may believe that some verses in this section are verses that are specific to leadership. The use of each specific verse in this section is believed to match what is presented in the Greek. There are a few Greek words that present some particular challenges to our understanding and allow for some of the verses used in this section to be arguable in regards to whether they relate to the relationship between true siblings in Christ or the relationship between those leading and others who are not leading. The verses that are in this gray area are noted with a double astericks (**) and include relevant, but brief commentary. Civil Law – how citizens should relate to one another on practical matters of daily living in relation to the government (i.e. the nation of Israel). Since Israel was tribal first, then became a kingdom there are several things that must be considered to view this area of Old Testament Law properly. Moral Law – how citizens should conduct themselves towards one another and towards God on matters of moral conduct as prescribed by God. Focusing on civil law and the subset of the moral laws that focus on how citizens in Israel were supposed to relate to one another, we should acknowledge an important fact. In general, citizens in Israel had EQUAL STANDING BEFORE THE LAW OF GOD. All parties were subject to the same laws. Some parties (priests) had special laws related to their priestly service, but when it came to day to day affairs of life all were subject to the same laws. This important fact cannot be overlooked. It establishes the core fact that citizens in Israel had a “peer” relationship (aka sibling-like) before God and His law. Let’s look at two example to re-enforce this point. Exodus 21:35-36 – And if a man’s ox injures the ox of his neighbor and it dies, they will sell the living ox and divide the money, and they will also divide the dead one. Or if it was known that it was a goring ox before and its owner did not restrain it, he will surely make restitution, an ox in place of the ox, and the dead one will be for him (the neighbor). In this example, a neighbor was a neighbor. It was someone living close by whose ox got free and did harm to another person’s ox. The owner of the ox was responsible for the damage done by his ox. There is no special exclusion for kings, priests, judges, elders, or any other person who owned an ox. Restitution for damage done was prescribed to set the neighbors fairly back in right relationship with one another. There are some complications that the more informed readers may consider from Old Testament law for laws surrounding daughters, wives, slaves, etc. However, it does not take away from the main fact that there was equal standing before the law of God. The same laws applied to everyone. This made citizens in Israel peers (aka sibling-like) to one another under one God. Seeing citizens in Israel as equivalents to siblings in Christ is not a perfect analogy. There are flaws in it, but the analogy should not be ignored. It is an important one to consider when considering siblings in Christ. It becomes especially important when we realize that under the new covenant believers in God through Jesus Christ actually take up the standing of an Old Testament priest in many ways. The special privileges reserved to Old Testament priests are now common to all believers in God through Jesus Christ. Where the old covenant had a few classes that separated the commoner from God, the new covenant does not. Eliminating this layer between God and man while maintaining the equal standing before the law of God is part of what brings us into full standing in God’s family as siblings in Christ. We also had to be adopted, but that is another subject. We will look at three different viewpoints on this subject. There are numerous verses in this category. The mutual relationship among siblings in Christ who all have the same Christ in them is the emphasis of the Bible. The weighting of scripture towards this perspective should inform and influence the perspective of the reader. It should also be noted that all of the letters of Paul are written to the general audience of all the believers in a particular location, not to any kind of representative leadership. There is one book, Philippians, which jointly addresses all the believers and the leaders. Mark 9:50 – Salt is good, but if the salt becomes deprived of its salt content, by what can you make it salty? Have salt among yourselves, and be at peace with one another. John 13:34-35 – A new commandment I give to you: that you love one another—just as I have loved you, that you also love one another. By this everyone will know that you are my disciples—if you have love for one another. Romans 12:9-16 – Love must be without hypocrisy. Abhor what is evil; be attached to what is good, being devoted to one another in brotherly love, esteeming one another more highly in honor, not lagging in diligence, being enthusiastic in spirit, serving the Lord, rejoicing in hope, enduring in affliction, being devoted to prayer, contributing to the needs of the saints, pursuing hospitality. Bless those who persecute, bless and do not curse them. Rejoice with those who rejoice; weep with those who weep. Think the same thing toward one another; do not think arrogantly, but associate with the lowly. Do not be wise in your own sight. Romans 15:4-7 – For whatever was written beforehand was written for our instruction, in order that through patient endurance and through the encouragement of the scriptures we may have hope. Now may the God of patient endurance and of encouragement grant you to be in agreement with one another, in accordance with Christ Jesus, so that with one mind you may glorify with one mouth the God and Father of our Lord Jesus Christ. Therefore accept one another, just as Christ also has accepted you, to the glory of God. Romans 15:14 – Now I myself also am convinced about you, my brothers, that you yourselves also are full of goodness, filled with all knowledge, able also to instruct one another. 1 Corinthians 1:10 – Now I exhort you, brothers, by the name of our Lord Jesus Christ, that you all say the same thing and there not be divisions among you, and that you be made complete in the same mind and with the same purpose. 1 Corinthians 11:33 – So then, my brothers, when you come together in order to eat the Lord’s supper, wait for one another. 1 Corinthians 12:25-26 – In order that there not be a division in the body, but the members would have the same concern for one another. And if one member suffers, all the members suffer together; if a member is honored, all the members rejoice with it. Galatians 5:13-15 – For you were called to freedom, brothers. Only do not let your freedom become an opportunity for the flesh, but through love serve one another. For the whole law is fulfilled in one statement, namely, “You shall love your neighbor as yourself.” But if you bite and devour one another, watch out that you are not consumed by one another. Galatians 6:1-2 – Brothers, even if a person is caught in some trespass, you who are spiritual restore such a person in a spirit of humility, looking out for yourself, lest you also be tempted. Carry the burdens of one another, and so fulfill the law of Christ. Ephesians 4:32 – Become kind toward one another, compassionate, forgiving one another, just as also God in Christ has forgiven you. 1 Thessalonians 5:11 – Therefore encourage one another and build up each other, just as indeed you are doing. Hebrews 10:24-25 – And let us think about how to stir one another up to love and good works, not abandoning our meeting together, as is the habit of some, but encouraging each other, and by so much more as you see the day drawing near. James 5:16 – Therefore confess your sins to one another, and pray for one another, so that you may be healed. The effective prayer of a righteous person accomplishes much. 1 Peter 4:9-10 – Be hospitable to one another without complaining. Just as each one has received a gift, use it for serving one another, as good stewards of the varied grace of God. 1 Peter 5:5 – In the same way, younger men, be subject to the elders, and all of you clothe yourselves with humility toward one another, because God opposes the proud, but gives grace to the humble. 1 John 1:7 – But if we walk in the light as he is in the light, we have fellowship with one another, and the blood of Jesus his Son cleanses us from all sin. 1 Timothy 5:1 – Do not rebuke an older man, but appeal to him as a father, younger men as brothers, older women as mothers, younger women as sisters, with all purity. These phrases are written to a younger man, Timothy, who is gifted by the Holy Spirit as at least an evangelist (2 Ti 4:5) but would have a good number of others who were older than he was. Paul was instructing Timothy on how he should conduct himself in regards to these ones who are older. If you are younger, the instruction is to appeal (parakaleo-TBD) to those who are older respectfully as parents and not verbally assault them. It is important to note that the instruction, “Do not rebuke” includes a Greek word (epiplesso – Strong’s 1969) which does not occur anywhere else in the Bible. The word rebuke most commonly comes from another Greek word (epitimao – Strong’s 2008). It seems that epitimao has more of the sense of speaking directly and charging someone who is at fault. However, epiplesso seems to have more of the idea of a verbal assault regardless of whether someone is at fault or not. Titus 2:15 leaves room for some level of stronger speaking in using yet another Greek word (elegcho – Strong’s 1651) which is similar to epitimao. [appeal to] (parakaleo) younger men as brothers … [appeal to] (parakaleo) younger women as sisters – these phrases are written to a younger man, Timothy, who would have some who were younger than he was. If you are older, the instruction is to appeal (parakaleo-TBD) to those who are younger as siblings. Titus 2:2-8 – Older men are to be temperate, worthy of respect, self-controlled, sound in faith, in love, and in endurance. Older women likewise are to be reverent in their behavior, not slanderous, not enslaved to much wine, teaching what is good, in order that they may encourage the young women to love their husbands and to love their children, to be self-controlled, pure, busy at home, good, being subject to their own husbands, in order that the word of God may not be slandered. Likewise, exhort the young men to be self-controlled, concerning everything showing yourself to be an example of good deeds, in your teaching demonstrating soundness, dignity, a sound message beyond reproach, in order that an opponent may be put to shame, because he has nothing bad to say concerning us. If you are older, there is a standard of behavior that is expected in order to be in a position to properly interact with those who are younger. The verse in 1 Timothy 5:1, does not set up any hierarchy. It establishes the approach to those who are younger and older. These verses in Titus 2 establishes a distinction from the idea of parents and children. In the parent-child relationship, there is an expectation of obedience even if the parent is not temperate, worthy of respect, self-controlled, etc. Titus sets up this expectation for older believers to properly interact with younger believers. 1 Peter 5:1,5 – I exhort the elders among you: shepherd the flock of God among you, exercising oversight not by compulsion but willingly, in accordance with God, and not greedily but eagerly, and not as lording it over the portion (those in your care), but being examples for the flock … In the same way, younger men, be subject to elders, and all of you clothe yourselves with humility toward one another, because God opposes the proud, but gives grace to the humble. This verse matches up with 1 Timothy 5:1 in speaking to those who are older and how they should interact with those who are around them. They also refer to how those who are younger should relate to elders. These verses remove any sense of hierarchical control that one might assume is held by someone who is in any kind of role of leadership. These verses do have the context of leadership by introducing the idea of how to “shepherd” and “exercise oversight” without “lording it over … but being examples”. These things most often referring to those who also have some leadership capacity in the church. The emphasis of what is addressed by the Bible is weighted towards believers relating to one another as peer-level siblings. This is modeled on the family where there is one father over a group of siblings from eldest to youngest. This is confirmed by Matthew 23:8-11 (“and you are all brothers … for one is your Heavenly Father”) and by reviewing the weighting of verses towards the idea of “one another” ministry as peers. There are 18 passages that address various aspects of peer-level ‘one another” ministry. Only after you add the factor age is there any amount of additional indication of some amount of some believers being higher than other believers. There are only a small number of verses that establish the idea that older believers have a standing that is deserving of more respect than younger believers. 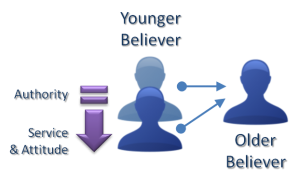 This doesn’t mean an older believer is “over” the younger believer in any positional sense, because some of these same verses also point partially or fully at the idea that older believers should not consider themselves as “above” younger believers. Let’s look at 3 key passages which are sometimes used by some to claim that some believers can have a positional place of “being over” or “being under” from an authority perspective. 1 Peter 5:5 – In the same way, younger men, be subject to the elders, and all of you clothe yourselves with humility towards one another, because God opposes the proud, but gives grace to the humble. Ephesians 5:21 is a “one another” verse written commonly to all believers and it shows the need to submission one to another without respect to age with the key phrase being “out of reverence to Christ”, which implies that we are to submit to the portion of Christ that we find in one another. It is not a personal submission to the other person, but to Christ in that person and what portion of Christ they have that can minister to each of us. 1 Timothy 5:1-2 has an obvious aspect of the younger believers (even if they are gifted and/or a leading one) appealing to older believers. Given the specific Greek word (parakaleo), we can know that the appeal is for a particular purpose and not in regards to any ongoing positional status. 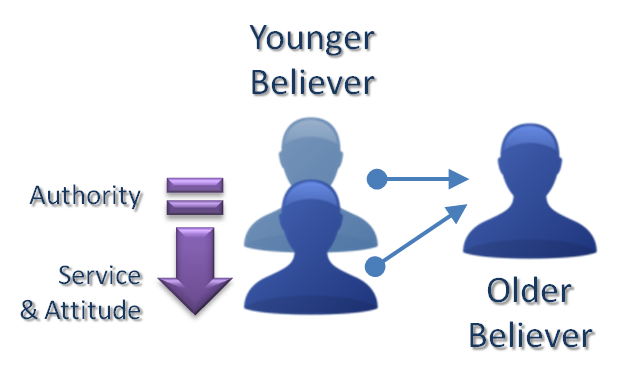 The less obvious aspect is that the believer that is older (even if they are gifted and/or a leading one) should treat the younger believer as a brother (a peer). This is a lowering down to the level of the younger believer. This matches with the use of the Greek word (parakaleo). 1 Peter 5:5 has the strongest possibility of setting up an older believer as “being over” a younger believer. However, there with quandary this verse. Using the full context of 1 Peter 5:1-5 we have to decide whether the context establishes that the references to “elder(s)” (presbuteros) is really referring to the subset of older believers who are also considered to be “overseers” (episkopos) or whether the references to elders is a general one that should be applied generically to all older believers. The decision you make on would seem to govern whether verse 5 is indicating that you should submit to any older believer or just those who are qualified and appointed by the Holy Spirit (Acts 20:17, 28). If you narrow your interpretation of “elder(s)” in these 1 Peter 5 verses, then it keeps the idea of older believers being over younger believers in a positional sense. It is left to the reader to decide whether the subject of siblings in Christ should really be included on a study of relationships defined in the Bible with authority. It seems that the level of authority of one sibling in Christ over any other sibling in Christ is very weak, if it exists at all. This does nothing to take away the authority of God in his role as THE Father in the family we call the Church. It also does nothing to take away from the authority carried when a sibling in Christ shares a word from God to another sibling in Christ. If the words spoken by a sibling in Christ match the mind and will of God, then they carry the full authority of God himself, but the sibling in Christ who is sharing this Word does not take ownership of this authority. It remains God’s authority and bearer of the message simply wields it for the purpose and scope of the message they bore to their sibling in Christ.